AOA to all: it is good news on the side of KPK but in Punjab and Federal did not have courage to fight the case. 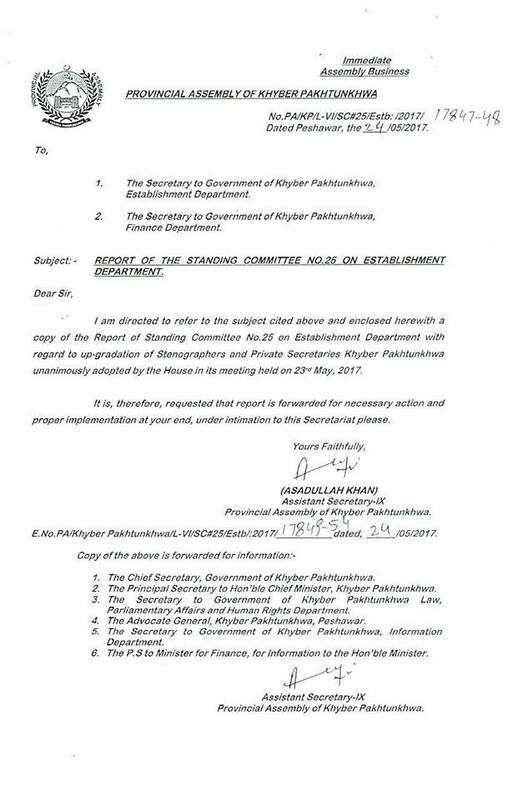 But the KPK members of the assembly should take place before the national assembly for up gradation of APS in BPS-17. Because most of members belong to KPK and most of them are attending the same in national assembly session. so, it my request to the KPK approach to KPK national member to putup case in the National Assembly so that up-gradation be made throughout Pakistan. Punjab Govt has upgraded the post of stenographer equal to Fed Govt stenotypist from BPS-14 to BPS-15 and also granted time scale promotion to its employees. Fed Govt should also upgrade the post of Stenotypist from BPS-14 to BPS-16 and likewise upgraded Assistants and introduce time scale promotion for all employees. My department was working with ministry of education but in result of 18th amendment/devolution it is now in Punjab govt. So my designation is stenotypist and in Punjab stenotypist is called stenographer. Now in recent upgradation BS-14 to 15, some of my seniors are refusing to upgrade my post with objection that stenographer has been upgraded and I'm stenotypist. What is the solution now? As the posts of clerks were upgraded, specially assistant from BS-14 to 16, is it fair upgrading the Stenos from 14 to 15? As stenos have always been in higher grade than assistant. after grade 15 in Punjab nobody protested against this decision steno association is also silent in Punjab and federal why? AOA - to All Steno Brothers: What will be the fate of Stenotypists and Stenographers those who were appointed in 1980's. I was appointed in 1984 in BPS-12 and now in BPS-14 no time scale no promotion only upgradation. When I was appointed Junior Clerk was in BPS-5 now in BPS-11 and Assistant/Head Clerk was in BPS-11 now in BPS-16. There is no promotion only two grade up (IS IT JUSTICE By this way Stenotypists should be in BPS-17 but no justice and those who are nearing to retire will get any benefit or not. JUSTICE MAY BE DONE ELSE ALLAH TAA'LA WILL ASK YOU. IN THE NAME OF JUSTICE. DO JUSTICE WITH US. A.o.A khalid sb ye jo case supreme court me he, APS k time scale keliye ya 10% Quota from APS to Suprintendent? Prom from BS-16 to BS-16???? All our colleagues i.e. APS/STENO are looking toward you sir, because u r the only leader of our community. Once again you are requested to kindly lead our community accordingly. AOA, Dear Colleagues, Please approach to Shahbaz Sharif or Maryam Nawaz have positive thinking and on the other hand, the government is going to complete the tenure. It is a good chance to approach to them. Our struggle should be like the time scale like ie. in Private Secretary case. The same criteria should be fixed. If any body go to writ in court, the decision should be in our favour. 2. APS (After Completion of 5-years service in BPS-17)....Granted BPS-18. Nobody is looking us and time is going fast and faster nearing to retirement if justice do not make in time means no justice we the seniors are not warded BPS-17 why????????? Dear Zulfiqar Awan sahab. I am ready to file case of time scale BS-17 to APS but who will support me? I spent a lot of money on litigation from my own pocket. Kash aap 10% qouta for promtion in Supdt categoery case file na krte tu na time waste hota aur na money. Hope you would be fine, we feel great after your coming into action once again that too after so many months, my humble suggestion is we must stick to time scale as you rightly suggested on the pattern of P.S this way we can get promotion up to BS-18 at the minimum. We will not disappoint you as this is fight of all of us and we have to be united being limited in Nos but thanks God working with very high ranked officers which will definitely give us an edge. It is never too late to chose the right path and then stick to it and we must now concentrate on time scale promotion for APS and no other thing. Another humble suggestion is late sitting allowance is not being given to APS who worked most in late hours with the senior officers but could not get this being in BS-16, this condition of BS-16 must be finished and LSA be allowed to APS/P.S also. Further more special Pay for APS/P.S must also be raised at least 100% because it is too meager an amount, keeping in view their nature of duty. My regards to my great leader and brother and do not worry we all will share as much we can and Insha Allah we will get our genuine right too. Thanks for reply. I hope all of our colleagues depressed from the present Government becoz this Government will not give us benefit. One more thing depressed me that every Govt. give the favour to LDC UDC AND ASSISTANT but STENO/APS are NOT. I cannot understand this discrimination between two category.... i.e. LDC/UDC/ASSISTANT AND STENO/APS.